One of my favourite TV shows is Person of interest. I was just finishing up my Computer science degree when the show first started airing I was amazed at how the Reese and Finch managed to so easily bluejack unsuspecting “numbers”. In High school I has a range of Bluetooth sniffers installed on my trusty and highly customizable Sony Ericsson. Unfortunately by the time person of interest started airing everyone had either moved to android or the iPhone and Bluetooth sniffing was never the same. Recently I purchased the Ubertooth One to see how much Bluetooth sniffing has changed since my high school days, this post documents my first attempts at Bluetooth sniffing / cracking with the Ubertooth One. An additional Bluetooth dongle or Bluetooth adapter. A PC which runs Windows, Mac, OSX or Linux. You can perform these activities on just about every major desktop operating system but for this tutorial we focussed on running this with Kali Linux. Ignore all of the blog posts and websites which tell you how to install / configure the Ubertooth One (most of them are no longer relevant). Update your Ubertooth firmware asap. One final tip make sure you have a range of additional Bluetooth tools you can use for Bluetooth debugging / sniffing if you’re having trouble with the install its good to have an arsenal of other tools you can use to verify if the issue you are experiencing is a configuration issue or a hardware issue. Getting the Ubertooth One setup for Bluetooth sniffing isn’t the easiest activity to get up and running so I recommend before you go into any sniffing you walk through some of the Ubertooth Ones other capabilities i.e. spectrum analysis. How does one listen in on Bluetooth? Once your Ubertooth is setup and configured you can run the following commands to analyse Bluetooth traffic. The majority of the scanning work I undertook was with using ubertooth-btle. This allows you to capture Bluetooth traffic between Bluetooth low energy compatible devices this is becoming one of the preferred methods of Bluetooth communication between new devices, next time you’re in a store just look at the Bluetooth devices most of them should say Bluetooth-low energy compatible. Warning: could not decrypt packet! Copying as is..
With some of my own BLE captures there wasn’t enough packet info to run crackle successfully so I ran crackle with some sample files to give an overview of how the tool works. Bluetooth, hopefully this article packages it up into a nice and easy digestible format as the process to get it to this level wasn’t that straight forward or error free. As always please let me know if found this article useful or if you didn't, Don’t forget to like this post or leave a comment below to let me know another area you would be interested in reading about. Thanks for your continued support! Until next time!. For those of you who have read a few of my previous posts may have noticed I use Kali Linux a lot, there’s a good reason for that its easily one of the most versatile and comprehensive Linux Distro’s available out there. 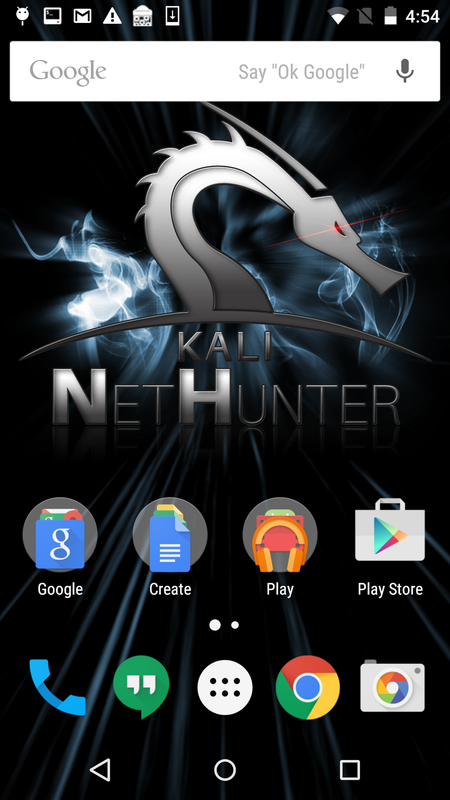 Recently offensive security the group behind Kali Linux have release Kali Nethunter which is basically Kali Linux packed into an Android smartphone or tablet. If anybody has seen or heard of the game Watch_dogs Kali Nethunter is like Aiden Pearce’s smartphone. For those of you who haven’t heard of Watch_dogs the premise is this: Aiden Peirce a notorious hacker roams around Chicago hacking a smart city with nothing but his smartphone. Kali Nethunter is pretty much the closest thing available to Aiden’s phone. I recently went about installing Kali Nethunter on a LG Nexus 5 this post documents what did and what didn’t work in regards to getting it up and running. I hope you find this useful and it may save you a couple hours in future when it comes to rooting your own phone or installing Kali Nethunter. Once again I remind you make sure you never carryout any of these activities on devices that don’t belong to you or that you don’t have permission to be working on. Kali Nethunter is a powerful tool use it wisely. [INFO] Please enter sudo password for install. [ OK ] Sudo access granted. [ OK ] Done, type adb or fastboot to run! Please make sure your device is in bootloader/fastboot mode before continuing. was not previously unlocked, this will wipe all your data ! You may need to enter your administrator password to continue. Press Ctrl+C to cancel ! at all, there may be a problem. So what next? After re-running the install process under Linux a few times and seeing no change I tried with windows, I was able to progress a little further but after installing Nethunter the phone kept crashing after trying to do something simple like unlocking the phone or trying to open the menu, the phone was once again rendered unusable at this point. 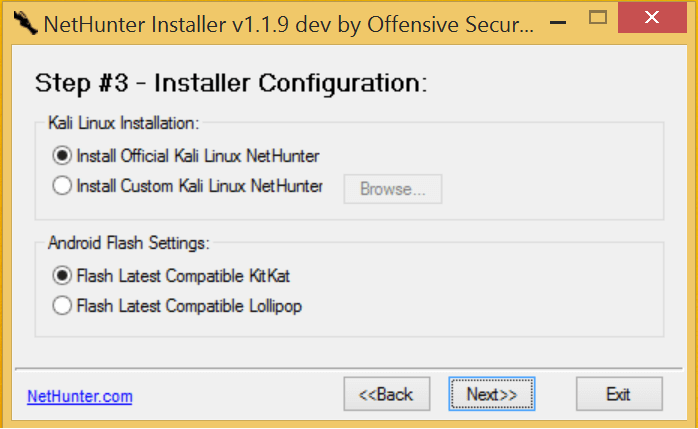 I then tried using the Kali Nethunter Windows Installer. Which was by far the easier and simplest of the three install processes I tried. You simply install the tool and follow the prompts it downloads all the necessary files and installs them. At the end I had a fully functioning Kali Nethunter device! You can run Metasploit on it! Offensive security have precompiled a number of handy penetration testing tools and attacks, you can see them in action on the Kali Website. You can use it as a webserver! You can use VNC and keyboard features to control PC’s. Please let me know if found this article useful or if you didn't, Don’t forget to like this post or leave a comment below to let me know another area you would be interested in reading about. As always thanks for your continued support! Until next time! So I found myself with some free time this weekend, so I decided I would put together a quick post on using one of the most widely used penetration testing frameworks, Metasploit. A few months ago I started looking into Metasploit and began teaching myself the basics, what struck me most from my initial observations and tinkering with Metasploit is how incredibly easy it was to use, which is great for Security professionals who are starting out or just people who are interested in the field. Often we read about security breaches and cybercrime in the news, in 99.95% of the articles on these topics take a high level approach (there are a wide range of reasons for why articles take this approach which I won’t delve into, but feel free to leave a comment on why you think this happens) unfortunately this makes it hard for IT Pros to figure out exactly what happened and how they can defend against these threats, fortunately tools like Metasploit help to bridge the knowledge gap and are leading us on the way to being a little more secure. As I briefly glossed over earlier Metasploit is a popular penetration testing framework and penetration testing toolkit, so what does that mean you may ask? In a nutshell Metasploit is a powerful tool which has thousands of prebuilt exploits (programs which can take advantage of security vulnerabilities to give you access to or control over a machine which you would not normally have control over). Metasploit also gives you the ability to write your own exploits for security vulnerabilities and execute them against machines. For those of you who aren’t Technical and don’t really understand what the above paragraph means I’ll summarise it this way: Metasploit is a tool which you can use to hack Computers, tablets, phones and other devices. So without further ado ill jump right in to explaining what you can do with Metasploit on an Android Phone. A PC with a Wireless card connected to my wireless network. As a quick reminder I owned all of the devices used in this example. If you were to replicate this example with devices you do not own it may be a criminal offence. Ensure that the android phone is connected to a local area network and make sure you know its IP address. Plug your bootable flash drive into a PC which is powered off and power it on (you may need to make sure that your PC checks for bootable media before booting off the hard disk. Once the PC has booted into Kali Linux make sure it’s connected to the same local area network as the Android device. A Quick note here this example carries out this activity on a single network and this example can be modified to work across multiple networks. So how do you get an meterpreter session on and android device? This by far the part where you can be most creative, the resource links show a few creative ways to do this using multiple Metasploit exploits. I don't want to give to much away so the method I used was to sneak it onto somebody’s phone by uploading it to a microSD card and install it while you have physical access to their phone, you could however hire Ninjas to take care of this for you. The LHOST address will be the attackers IP address (your Kali Linux machines IP). Now that you have a session open make sure the user clicks on the app called MainActivity and then you can begin with meterpreter. No files matching your search were found. I didn't have much luck with this one it seemed to produce files that were not playable, but that could be something to do with the PC I was using. Here's an example of a Metasploit camera stream in action. Only install apps and software from the google play store. 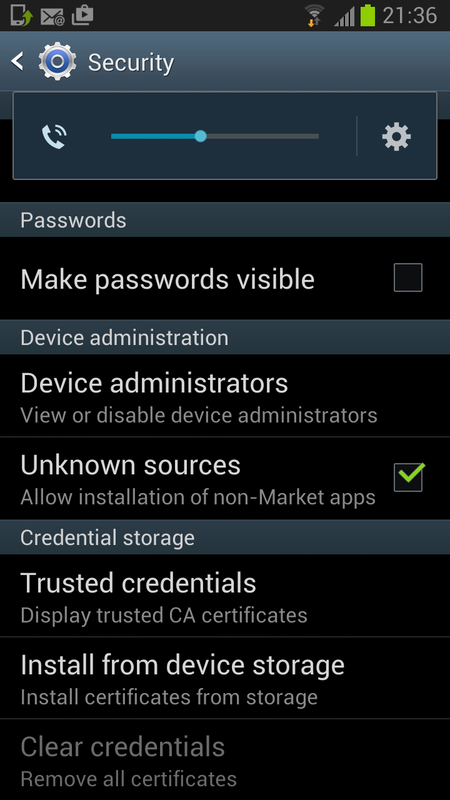 Run some sort of (trusted) 3rd party security software and regularly audit your phone. Make sure you don’t have enable installs from unknown sources enabled. Keep your phone in your possession at all times. Avoid opening any suspicious links in emails or text messages.